inhibitors of numerous enzymes involved in nucleic acid processing can be used in the development of various antiviral drugs. 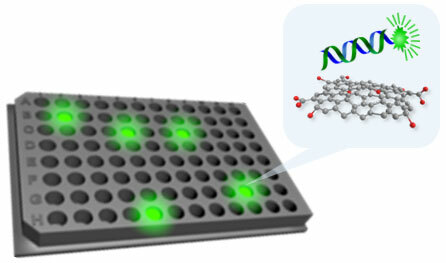 Biosensors based on Graphene Oxide and Its Biomedical Application. Lee JS, Kim J, Kim S, and Min DH. Adv Drug Deliv Rev. Na HK, and Min DH. Adv Health Mater. 2016; 5; 2386-2395. Lee J, Yeo J, Na HK, Kim YK, Jang H, Lee JH, Han SW, Lee Y, Kim V. Narry, and Min DH. ACS Nano. 2013; 7(7): 5882-5891. Discovery of Hepatitis C Virus NS3 Helicase Inhibitors by a Multiplexed, High-throughput Helicase Activity Assay Based on Graphene Oxide. Jang H, Ryoo SR, Kim YK, Yoon S, Kim H, Han SW, Choi BS, Kim DE, and Min DH. Angew Chem Int Ed. 2013; 52(8): 2340-2344.